The lady dressed in elegant Chinese costume standing by a flowering plum tree in a perfect full moon night represents the Spirit of the Plum Tree. 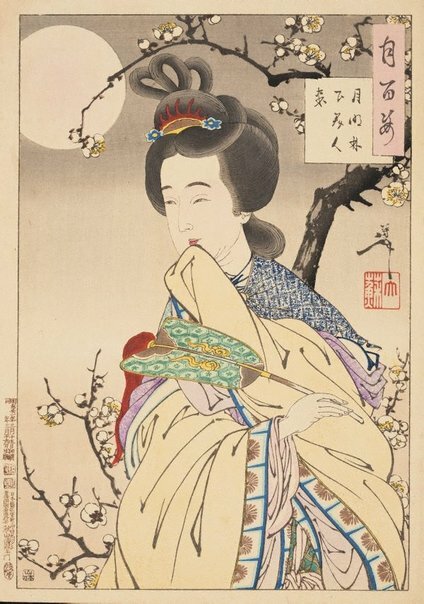 She is said to have appeared to the seventh-century Chinese poet Zhao Shixiong when he made a pilgrimage to Luofu in southern China to visit the plum trees there. Tired from his trip, Zhao fell asleep under a tree and a beautiful lady – the Spirit of the Plum Tree – appeared in his dreams. The incident inspired him to compose a poem.